SecuraSoft™ OST Splitter tool one of the best approaches to divide the Outlook OST files to smaller fractions, so that it becomes easy for the users to preview the files. Moreover, it even allows the users to split the OST files by applying filters like Date, Size, Year, or Folder. MS Outlook OST Splitter allows user to split .ost file having any size to many smaller fractions. Using the utility, it is possible to truncate the UNICODE as well as ANSI OST files without any data loss. In addition to it, the application keeps all Meta properties like To, Cc, Bcc, etc., intact after completion of process. The program provides users an option where they can split OST files on folder basis. 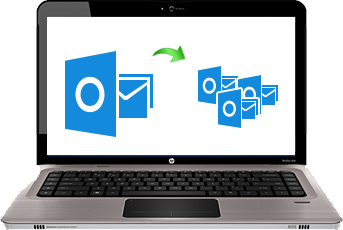 Users can easily create multiple .ost files to Outlook 2010 & 2013 editions. 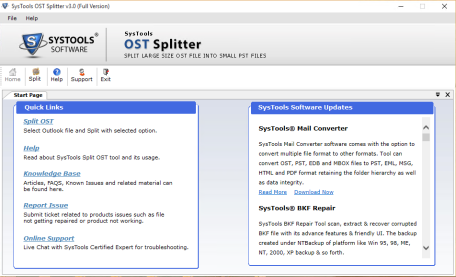 OST splitter software permits with creation of a single file for desired folders available in OST files. It even divides a specific particular by size. Users can even split the archive OST files. Using the software, user can split oversized OST files to multiple parts, through same size for every file. 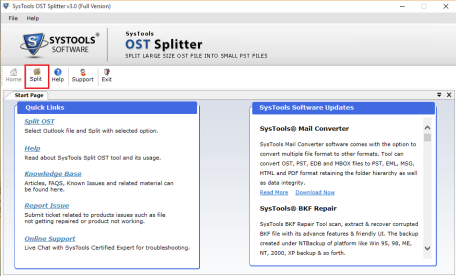 The OST splitter application splits Outlook files into multiple segments accordingly file size range between 5MB to 10GB. 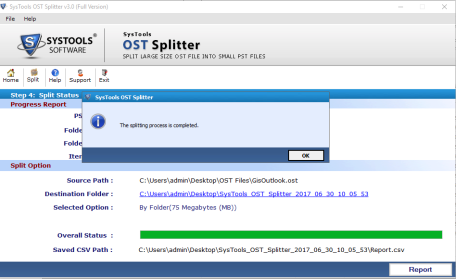 OST Splitter tool does not support the splitting OST files which are corrupted due to large size. If a user aspires to break OST file by year then, utility provides an option to split OST by year for dividing OST data annually. The tool even creates separate OST files on basis of year. For instance, if user opts from 2017 to 2020 year, in that case, the tool provides 4 OST data files. Each file contains data of single year. With the help of tool, users are capable to divide OST data files by date. 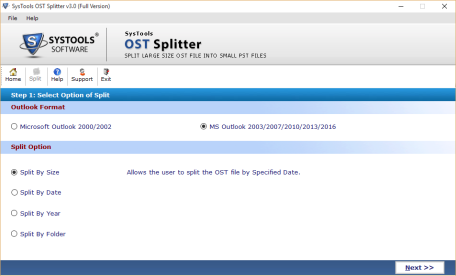 OST splitter tool allows the user to decide specific date and truncates Outlook .ost file in two parts. One file comprises of the items 'of and prior' to a defined date and the other file includes data ‘after’ a specific date. OST Splitter allows users to break oversized .ost data in smaller fractions without original structure being affected of source data file. After splitting the files, software creates a new folder for saving files in customized manner. CSV files are even saved to similar location. OST Splitter Tool is so robust that it allows the users with many options to split the OST files. The best part of the split oversized ost file of outlook tool is its repairing the corrupted OST files. It has a brilliant GUI that it makes it different from the other utilities across the globe. I recommend each and every user should give it a try that are stuck in the problem of oversized OST Files. I have never come across such a utility that resolves all the problems in a single go. The tool is just incredible in its own way including the tangible features. The most amazing feature is splitting OST file by year. A heartedly thanks to the developers! for OST Splitter. Three Cheers for your success guys. I just want to say thanks to the developers for developing such a product. Split OST file in Outlook tool is just amazing with many astonishing features like splitting by date, year, and size. I must say there must be creative minds behind the development of OST Splitter tool. Kudos! to the team for their success. I am so mesmerized by the working of the tool. Divide OST file of Outlook has such a simple designing algorithm that everyone can easily use it without knowing much about technical stuff. I tried the demo version of split OST Software and it easily served my purpose and it was so helpful that I purchased the entire setup. Thank you team! OST Files: When one uses MS Exchange account, all emails, calendars, and other material is delivered and saved on the server. One can even configure MS Outlook to make and save replica of data on system in OST file. While doing this one is subjected to use Cache Exchange Mode in offline mode. The .ost files are always sync with Exchange computer when a connection is available. Offline folders are basically the copy of files found in mailbox on system that are having MS Exchange. It becomes easy to take folder from the location present on the server, work with matter of file when not connected to network. The moment one is connected again, update file and its respective server folder to make the matter look alike. It is termed as synchronizing files and folders. Why the OST Splitter Tool is Vital? The OST Splitter tool works around every complicate situation like dividing the OST files by date, year, size etc. It even renders the users with options to store the OST files to any new location after splitting into fractions. Sometimes, Split Oversized OST files get corrupted and it becomes difficult to repair them. OST Splitter tool even repairs the corrupted OST files. OST file in Outlook provides the users with options to divide OST files to UNICODE PST files without any file size limitations imposed on it.